There are many bands that have called themselves Dead Poets Society. A Finnish rock band, a Slovakian band, and the better known U.S. electronica/rock band. The Slovakian band was formed at the end of the year 1997 in Bratislava (capital city of Slovakia) under the name Crusader. None of the founding members had any significant playing experience so the band started to practice cover-versions of favorite groups (Deep Purple, Savatage, Blind Guardian, Hypocrisy...). During this period the group tuned up and in summer '98 performed its first concerts. After the consolidation of the band formation, the work on own compositions was speeded up and by September '99 the first demo Crusader - Victims Of The Holy Season was released. This 30 minute CD, carrying melodic power-speed metal ensured the band a firm position on Bratislava's scene as well as the appreciation of magazines from all over Europe. Successful concerts and some months in the rock hit parades of Slovak radio stations confirmed the status of the band on the home scene. During a year more then 250 CDs of the first demo were sold and more then 100 were distributed for promotion purposes. In spite of this relative success the band was aware of the shortages and mistakes it made when preparing the first demo and with this recognition started to work on new material. The songs made in the year 2000 have shown to be more mature in composition, deepening and widening the musical expression, which is more complex, heavier and together with the lyrics has a darker mood. This shift caused some personal disagreements that culminated in the change of the singer and guitar player. Through the new members the group gained talented musicians, who immediately showed their skills and added to the current expression the right touch. Giving to all the changes it showed to be the right time to change the band's name. The main reason was the fact that there are a few groups with the same name. 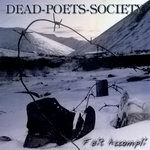 Under the new name Dead Poets Society the band made a second demo CD Fait Accompli, which fully confirms the move in the musical direction not rejecting, but emerging from the melodious sounds of the first demo. Dead Poets Society with its new material is aspiring for the interest of the whole metal scene and is not concealing its ambition to pass the borders of Slovakia. By changing its name and with the hardness of its current expression the band has made a step with which it dares to enter the European metal. The U.S. band was founded in 1998. It is the earliest documented band using the name Dead Poets Society. The group is best known for their remixes of artists Nine Inch Nails, Depeche Mode, Madonna, Minefield, Collide, and Hotboxed as well as their original albums The Electric Haze (2001) and Deprogramming (2002). Their sound has been labeled goth, electronica, rock, and alternative. In 2001 they toured with the bands The Dragonflies and King Black Acid who were notable for their film soundtrack work for Sugar & Spice and The Mothman Prophecies. In 2002 they toured with the Grammy-nominated Electronica artist Spectre VII. Currently the band is putting the finishing touches on their third album, tentatively titled "The Bone Church". This artist tag is also used for quote clips from the movie Dead Poets Society.